Monitor riser features an X-type structure that enhances its stability to ensure your valuables are securely displayed. Large worksurface is suitable for one monitor and one laptop. Height-adjustable design accommodates users with varying heights. Worksurface holds up to 33 lb. The keyboard tray capacity is 5 lb. 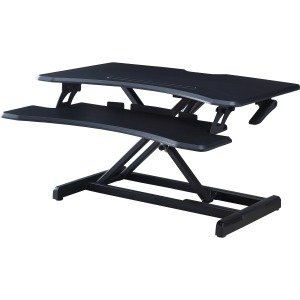 Monitor riser is perfect for enjoying the healthful benefits of standing while you work.